There are days when I feel SO BRAVE and AFRAID and ALIVE all at the same time. I think it’s a universal experience when you’re trying to be true to who you really are and when you make movements in your life in directions that are more YOU and LESS everyone else. It’s funny because the more ME I become the more I am okay with YOU and okay with community. The thing that gets weaker is fear–when I live with a whole heart. One of my fears that’s weakening is talking about what it’s like to be a woman in youth ministry and talking about what it might be like for my daughters some day to be leaders in the next generation. I have to be honest and say that I haven’t published much of what I’ve written. In the past I have been timid—no afraid– of THINGS both real and imagined, and had decided that I wasn’t ready to find out if some of those things were actually more real than I had imagined. The root of this stand-off-ish-ness in writing about something really important to me, I believe, was a genuine desire for normalcy. I wanted to be normal. I didn’t want to stand out to my guy friends as different. I wanted to rock leadership because I was good at leadership. I wanted to lead well in youth ministry because I care about the youth we minister to. I wanted to set an example for believers and I didn’t want my name to be synonymous with friction. Writing about my experiences or on the topic in general made me feel like I was different. Writing about it meant someone would probably disagree with me and that would cause friction. Writing or speaking about it meant that someone might think I’m whining and shut me off. Isn’t it peculiar how our imaginations limit us when fear has us in a head lock? This has been that one thing that I just didn’t want to mess with because it seemed too messy. Talking about something real and honest and vulnerable doesn’t make you any less of a person, it actually makes you more of one. A a couple of years ago—an awesome Christian youth camp said yes to me, as a main stage speaker. They hadn’t had much of a female speaker presence, with the exception of Justin Bieber’s mom, I was sort of their first regular girl preacher. A blip on the camp event radar was a 12 year win with my event promotional flyer frustration—the frustration with value being spoken but value not being given. I wasn’t giving up on them because I wasn’t sure that they had given up on me (on females as main stage/ key note communicators). They weren’t against this reality—they just hadn’t had anyone engaging them in the conversations. When I realized that, it meant leaning into that and finding out what normal could look like in the not-so-distant future. I’ve been the first for a few different organizations and denominations, and sometimes the only female that’s in visible pastoral or creative leadership. But it doesn’t make me different—it makes me a part of the re-normalization, a part of the redemption, a part of the making things right again. It isn’t always easy but I’m learning how worthy of my time it actually is—especially when I see things changing before my eyes. Things are rapidly shifting back to normal, good, right. Saying yes to the mess of it is sort of where it all begins. Not being cynical but being sensible and brave. We can say yes to participating in getting us together–same team-same page-cheering for each other as God created us to do, and working for rightness wherever it is wrong. Maybe we all need to step into the abnormals a little bit more, wade around in it, get to know it, embrace and love it…then work together to bringing normal back, together. It is normal to have friction. It is normal for us to debate. It is normal for us to differ in opinion about important things. It is normal for us to not see eye to eye. We operate in tension like this EVERY day because we are all different. Being different makes us normal. Not seeing eye-to-eye doesn’t make you a baboon. The secret for life in the robust conversations is having the humility and capacity to welcome “the other” through to the end. The tragedy is that fear can lead us to live like we believe that. Pick something out–a fear, a doubt–and gently step away from it and toward the places where you seek to understand, listen, and learn. As you get into all of that, yes, you’ll find a mess, but you’ll also find a path where wholeness begins and normal remains. What will you claim as normal today? What will you walk toward and what fear will you walk away from? 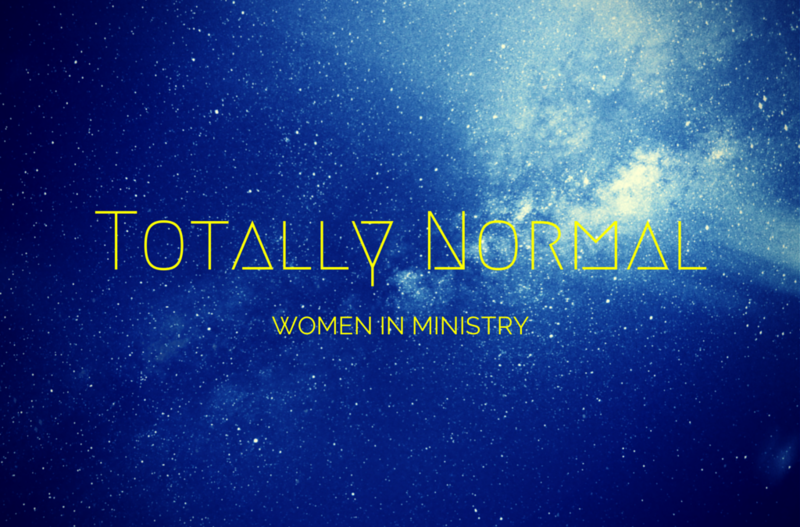 Thank you for posting about being a woman in youth ministry! I am as well! I am the Assistant Youth Pastor at a church ((in Florida)). I absolutely love it and I am new at this so I have been looking for a sort of mentor for about a year and then recently I found your blog! Although we may never meet or talk in person please know that just by reading your blog I have been encouraged and have began to learn so much! Thank you for everything! Hi Shelby–thanks for saying hi. I’m so glad you did. We’ve got awesome work to do here in Florida and I’ll be cheering for you! Thanks for reading and for giving your ALL to Jesus and those teenagers in your group. YES! I love this. Your heart is awesome. I’m so thankful that women like you are out there in front making things happen for the rest of us. I’m thankful for you Hannah. Your honesty and creativity are leading the way. Thanks for reading!